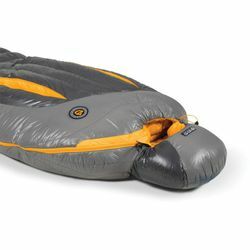 NEMO Sonic -20 Down Sleeping Bag. The Backpacker Editor’s Choice Award Winning Sonic™ has been praised as the only bag you really need from -20 to 40 degrees. Now updated for 2019 with a redesigned draft collar and draft tubes to create a secure seal against cold air; overstuffed 800FP hydrophobic, RDS certified down; and an updated profile and shaped footbox, the Sonic™ continues to rock out as the King of Comfort from basecamp to summit.